They started to arrive at Grays in November 2001, all being there by January 2002. At that point the Grays operations changed hands, coming under Arriva Southern Counties (Southend) control. The only difference this made to the buses was to the legal lettering. Two of the buses, 4510 and 4512, had to be reregistered in the spring of 2002, when it was realised that the registrations they had did not match their VIN numbers. 4512 had to be done twice, with 4510 then getting its temporary registration and 4512 taking 4510's original mark. Also in January 2002 the first ten 10.8m single doorway Cadets arrived to take over the Surrey Hills routes to Dorking and Cranleigh. They were route-branded at the rear of the cant-rail: serving the Surrey Hills. 3923-3926 were allocated to Cranleigh for use on the Surrey Hills routes, the rest to Guildford. Some of the Cranleigh buses received an early repaint, losing their branding in the process. These buses were thus some of the last to receive interurban blue.blue livery, which became the standard livery. Cranleigh was downgraded to outstation status in , its Cadets becoming part of the Guildford allocation. 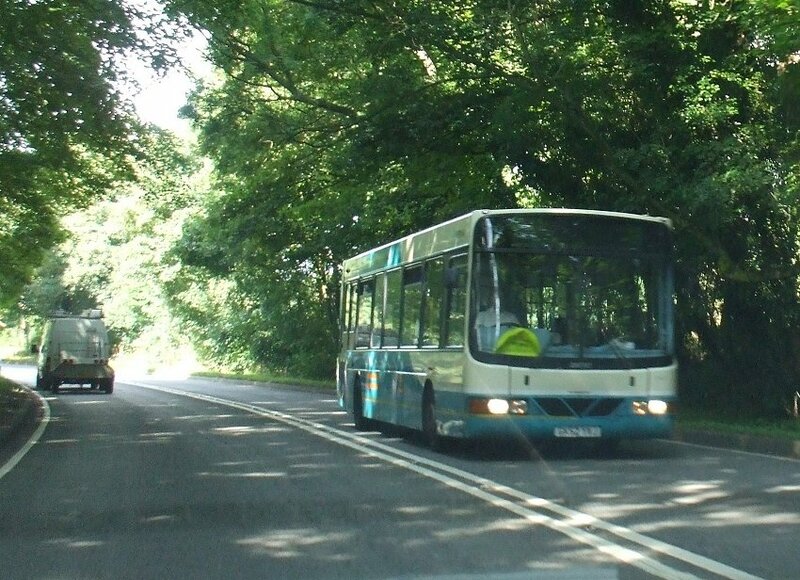 Cranleigh was closed operationally in September 2012 when it lost some of the Surrey Hills routes to other operators. The Guildford buses, despite their route branding, were used indiscriminately with the second batch (see below), and could turn up on almost any route operated by Guildford, whether country routes or Guildford locals. A further twelve (3933-3944) came to Guildford in December 2002 for routes 34/35. Most of these were route-branded on top of their standard turquoise and cream livery. 3970 was a replacement: 3936 had suffered a disastrous engine fire in November 2003, and was eventually replaced by 3970 in March 2006. Repaint into interurban blues came with a more discrete route branding for the 34/35 on the rear cant-rail, for some. It did not stop them turning up on other Guildford routes, including the surviving Surrey Hills routes. Digital displays replaced the troublesome motorised blinds. Fourteen short (9.4m) single doorway Cadets arrived in January 2004 for Arriva Kent Thameside's take-up of TfL's B13 and B15 routes. Naturally they came in red livery, and worked from Dartford. 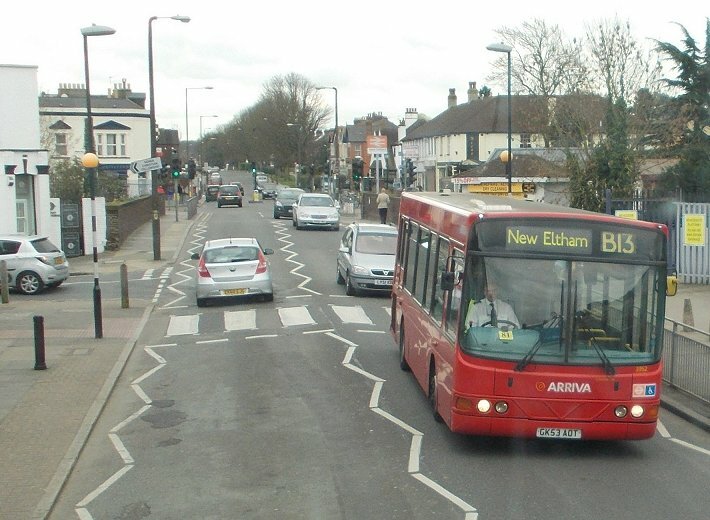 In January 2009 the Cadets from the B15 were displaced by Enviro200 Darts, but took over on route B12 (Joydens Wood - Erith), taken over from London Central and extended. They did appear occasionally on other routes, such as the 233 (Swanley - Eltham), 162 (Eltham - Beckenham Junction), 428 (Bluewater - Erith) and even the 160 (Catford - Chislehurst). Perhaps this was because they were popular with the drivers. 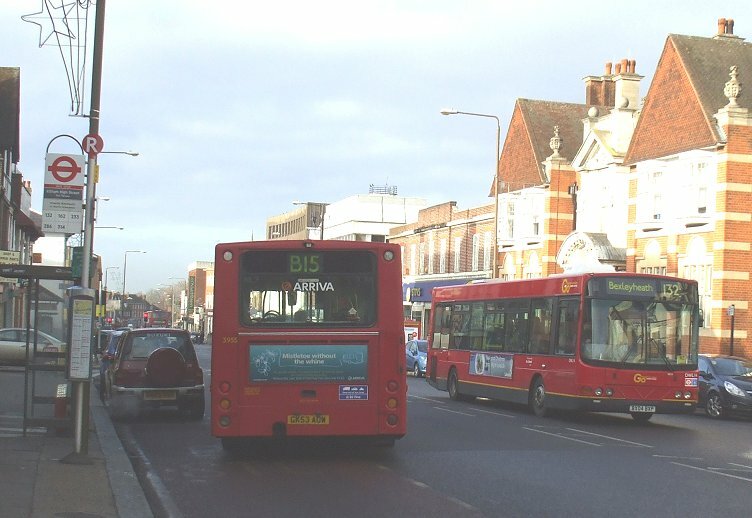 Meeting of Cadets: Arriva's 3955 on the B15 meets Go-Ahead London's DWL14 on the 132 in Eltham High Street, December 2010. 3952 on the B13 near New Eltham. The autumn of 2015 saw the Dartford Cadets either dispersed or placed into store. The latter then went to Arriva Midlands in spring 2016 for spare parts retrieval. Three new Cadets were bought for Grays in June 2006. 10.2m, dual doorway red buses, they were distinguishable from the other Cadets at Grays by the white excrescences on their roofs - air conditioning for the driver in a huge pod, and two smaller pods amidships. They were intended for the 498, (Brentwood - Romford Station, displacing DLA double-deckers in the main, although requiring double-deck assistance in the peaks. 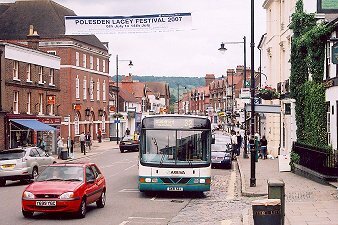 The route was swapped with First Bus for the 499 (Gallows Corner - Heath Park Estate) in June 2008, both routes requiring three buses. 3974 was an early loan from Arriva London to Dartford. DWL19 was loaned in September 2006 for use on route 160, but promptly transferred across the river to Grays for use on the 256, and later the 498. It gained an Arriva Southern Counties number - 3974 - but after six months returned to Arriva London and its old number. 3975 was the prototype Cadet, CW1. 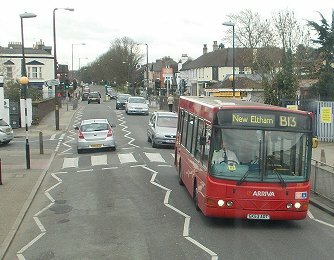 After six years with Arriva London North it was loaned to Southern Counties in December 2006. It went to join 3974 at Grays, on the 256 and 498, as 3975. It stayed rather longer than 3974. In January 2008 it moved to Dartford for the 428, then went on loan to Arriva the Shires at Garston, to fill in on the H18/H19. It only stayed until August 2008, returning then to Dartford. 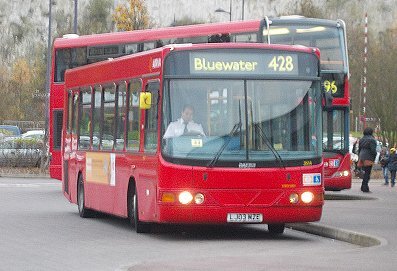 In march 2009 it was away again, this time to Horsham, where it was an "acceptable TfL spare" for the 465. Not much used, it was off again in July to Garston for two months, before returning to Horsham in time to be bought with the 465 by Metrobus, who did not want it and didn't use it. DWL10 was a short-term loan that did not acquire a Southern Counties number. In early 2007 it had been a mobile float bus with Arriva London to enable the i-Bus fitment programme. In March it was loaned to Grays for the 256 and 498, then moved across the river to Dartford in June. It went back, to Enfield, in September 2007. 3514, alias DWL57, came to Grays in December 2011, as a replacement for 3510, which had been written off. It was withdrawn at Dartford in December 2013, then moved on for service at Southend. 3514 at Bluewater on the 428 to Erith, December 2013, shortly before withdrawal from TfL service. 3515, alias DWL56, came to Dartford in March 2012, stayed six months, then went, still red, to Arriva the Shires at Garston. 3516-3517 and 3519-3523, 3527 were part of the general diaspora of Arriva London DWLs during 2012. Withdrawn by Arriva London early in the year, they were placed in store, then converted to single-doorway, upseated to B32F, and repainted in interurban blue/blue. They reappeared in September and October 2012, allocated to Guildford. 3524 and 3525 arrived from Arriva London (DWL13, 12) in October 2012, still dual doorway, still red. They went to Grays, which had a plus-two requirement for the 499. They moved on in 2014, 3525 going to Garston, and 3524 to Southend as a trainer, where it donned reverse Arriva livery of white with a blue cow-horn. T3526, T3533, T3536, as Arriva London's DWL30, 37 and 40, were part of their training fleet, and came to Northfleet in May/June 2013. They were retained in the training fleet livery for Arriva Southern Counties, T3526 soon going to Maidstone and T3533 to Gillingham and then Southend. T3536 went direct to Arriva Southend. Bus Stop Cadet index. 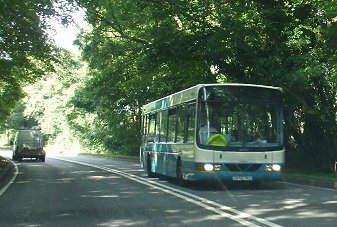 Arriva Southern Counties. bus histories. photo refs.